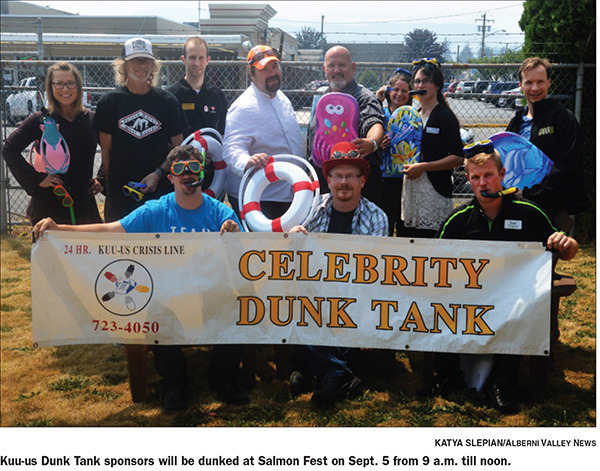 Eleventh-hour good news will give 44th annual Salmon Fest entrants a shot at catching the biggest salmon in recent years. Salmon Fest president Dan Washington polishes up a trophy ahead of the 44th annual Salmon Fest. “The big fish will be back for this year,” said Salmon Fest president Dan Washington. That means that contestants will be able to keep one fish over 77 centimetres and one below—both chinook and coho. Washington’s not sure that any giant salmon will be caught this year. Of course, he’s also gung-ho for a matching fish. “We’ll take a 44 for 44th,” said Washington. For those not focused on the fishing, there will be plenty else to do. “Fish is ordered, beer is ordered, cider is ordered,” said Washington, rattling off Salmon Fest’s big attractions. Chainsaw art will also make an appearance. The famous Kiwanis barbecue team is getting ready to cook thousands of pounds of salmon over alder so green that it was still a tree earlier this week. The beer gardens will look a little different though. “We have more fencing this year so you won’t have the blue tarp,” said Washington. And there will be lots of that. “I know Lance Lapointe is going to be featured a couple of times,” said Washington. Fireworks for Friday night at Victoria Quay have been approved for the festival by the fire chief despite recent fire bans, Washington added. The 44th annual Salmon Fest takes over Clutesi Haven Marina from 6 p.m. on Friday, Sept. 4 (fireworks will be around 9 p.m., or when it’s dark) to 5 p.m. on Monday, Sept. 7, when trophies will be awarded for the winning fish. Entry is $40 a rod and daily prizes are $5,000, $2,000 and $1,000 for biggest, second biggest and third biggest fish respectively. The biggest fish of the weekend will receive an extra $10,000 on top of the daily prize. The Lions Club kids bullhead derby kicks off at 9 a.m. on Sunday, Sept. 6.